Last month we characterized 2017 as the year Sub-Saharan Africa’s startup scene found its stride. 2018 looks to be the year of numerous VC investments. January got the funding party started. U.S.-based private equity firm TPG Growth acquired a majority stake (of an undisclosed value) in entertainment company TRACE. TRACE is a global multimedia giant for African music and film content with 200 million viewers and listeners in 160 countries, 30 mobile services, 21 pay TV channels and 7 FM radio stations. TPG Growth will “partner with TRACE’s co-founder and management to build a global leader for Afro-urban music and entertainment,” said a company release. There’ll likely be more Africa investments for TPG Growth in 2018. Last October the firm raised $2 billion for The Rise Fund, founded by TPG managing partner Bill McGlashan with Bono’s support. Paris-based VC firm Partech Ventures raised $70 million for an Africa fund and opened an office in Dakar, Senegal. The firm — with more than 250 investments and 45 exits globally — pooled financial support from partners such as IFC, European Investment Bank and Averroes Finance III. Partech managing partners Cyril Collon and Tidjane Deme (a Google Africa alum) will manage the new fund. “The focus will be tech startups that harness large emerging market opportunities with their main activity in Africa,” Partech’s Tidjane Deme told TechCrunch. “We’ll look for opportunities in financial inclusion, mobile and online consumer services, mobility, supply chain services and digitization of the informal economy.” Initial funding rounds will be Series A or B, with the possibility of follow-on rounds to well-performing companies, according to Deme. Partech plans to hit the ground interviewing startup candidates soon. All of Africa is open, but Deme said they’ll expect to recruit a number of ventures in countries such as Nigeria, Ghana, Kenya, Tanzania, South Africa, Ivory Coast and Cameroon. Lagos-based renewable energy startup Rensource raised $3.5 million in what it called “Pre-Series A bridge funding” from Amaya Capital Partners and Omidyar Network, among others. “We’re a distributed energy company. We take energy directly to people, businesses and consumers, because we’re operating in a market where the grid basically doesn’t work,” said Rensource founder Ademola Adesina. The company offers B2C and B2B solar and battery-based power packages (hardware and service) to individuals and businesses, primarily in Lagos. On the B2B, Rensource “enables any number of third parties to be their own energy company,” explained Adesina on the startup’s programs for small businesses to purchase and then sell Rensource services and equipment in their communities. Rensource will use its new capital to expand to regions in Nigeria outside of Lagos. Over the next few years, Adesina hopes the company can capture 5 percent (or 3 million) of what he estimates is a 60 million unit market. In other tech media moves, Ringier Africa will distribute New York Times content across Africa through a partnership with the U.S. news outlet. 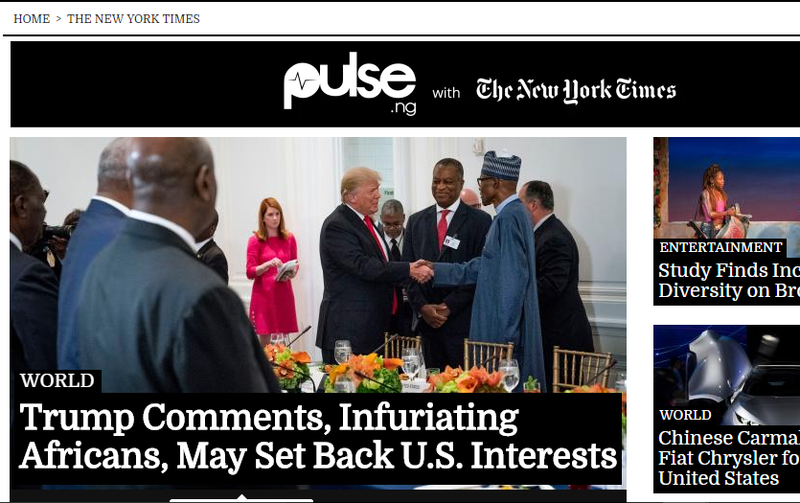 The subsidiary of Swiss media group Ringier AG will offer select NYT coverage through three “Pulse with The New York Times” sites in Nigeria, Kenya and Ghana. The online stories will be free to readers in Africa, without subscription fees or article limits. The partnership “is about bringing the content that isn’t being read yet in Africa through distribution optimized for mobile and low broadband internet to a wider population,” Ringier Africa CEO Leonard Stiegeler told TechCrunch. Roughly 100 million people currently access Ringier Africa’s Pulse platform. As the continent’s internet, mobile and tablet penetration continue to increase, digital content consumption is expected to expand rapidly. “There’ll be hundreds of millions of new mobile screens in Africa…That’s why international publishers are interested,” said Stiegeler. Finally, an update to TechCrunch reporting on Nigeria-based SureRemit’s plans to launch a crypto token aimed at remittances. The company’s January ICO raised $7 million in token purchases, which can now be used as payment through a network of merchants in Nigeria, Kenya and Rwanda.